Finance minister says he anticipates more investment from Beijing this year after a mission there. 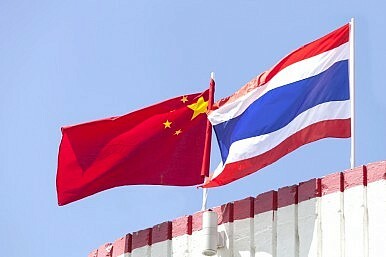 Thailand is anticipating more investment from China this year, Thailand’s finance minister said this week. China is already a significant investor in Thailand: during the first nine months of 2015, Beijing invested more than 12 billion baht (about $4 billion) into Southeast Asia’s second largest economy, making it the fourth biggest foreign investor there according to the Board of Investment (BoI). But with Thailand’s economy struggling to take off, officials have been eying even more investment from key countries, including Beijing. The government has declared 2016 a “Special Investment Promotion Year,” with a range of investment privileges designed to woo foreign investors. These include a double depreciation expense for acquiring new assets, a fast track for the approval of public private partnerships (PPPs), and several tax deductions and exemptions. Over the weekend, Finance Minister Apisak Tantivorawong led a mission to Beijing to meet a group of leading Chinese investors, including China National Building Material Group and Power China Group. After outlining Thailand’s investment program as well as potential privileges in ten selected industries, Apisak said that a number of Chinese enterprises had expressed interest in several priority areas across the country. The Industrial and Commercial Bank of China Limited (ICBC), China’s largest bank (which also funded the meeting), has also reportedly said that it is willing to offer funding for Chinese investors hoping to invest in Thailand. In terms of specific new opportunities, much attention in particular has been focused on China Investment Corporation (CIC), a sovereign wealth fund that has expressed interest in investing in the Thailand Future Fund (TFF). TFF, set up to raise 100 billion baht ($2.8 billion) for infrastructure projects across the country, has been marketed by the Thai government as a good opportunity to invest in one of the country’s growth engines. According to the Thai newspaper The Nation, Apisak said that to facilitate the investment, the State Enterprise Policy Office will deal directly with CIC. In addition, relevant groups within Thailand are also planning to make it easier for China to invest in the country more generally. For instance, Jitti Tangsithphakdi, the president of the Thai-Chinese Chamber of Commerce, told the Thai newspaper The Bangkok Post this week that the Chamber plans on setting up 14 departments to help facilitate Chinese investors interested in Thailand. In addition, he said that it was also mulling the establishment of a one-stop service center for Chinese investors by working with government agencies, including BoI and the Ministry of Commerce. The two sides agree on the cost of the first phase of a key project in Beijing’s infrastructure ambitions in Southeast Asia. What’s With the New China-Thailand Military Facility?China-Thailand Rail Project: New Movement, Old Problems?China, Thailand Sign Rail, Rice, and Rubber DealsChina’s New Rail Project With Thailand Hits Snag Why Is China Buying One Million Tons of Rice from Thailand?